Here's a Philips Hue deal which is great if want to get started with Hue, but equally fantastic if you already have a Hue set-up in your home and you want to add a few new bulbs. It's as if Amazon Prime Day has arrived early. This Philips Hue White and Colour Ambiance B22 Starter Kit is currently £109.99 at Amazon AND it comes with an Echo Dot thrown in. The kit contains everything you need to get started with Hue. There's the essential Philips Hue Bridge, which plugs into your router and is the bridge between you (or a rather your controller, which can be the Hue app, a remote switch or a smart assistant) and your lights. Then there are three B22 bayonet bulbs which offer over 16 million colours and over 50,000 shades of warm to cool white light. And finally, this deal includes an all-new 3rd gen Amazon Echo Dot so you can control your new light set-up with the power of your voice. Even if you already have Hue in your home, this is still a stunning deal if you want to add a few new bulbs. A dual pack of B22 bulbs retails for £84.99 at Philips's Hue site and £74.81 at Amazon, so to get three bulbs AND a Bridge AND an Echo Dot for under £100 is a steal. If you only need the bulbs, you can give the Bridge and the Echo Dot away as gifts. We're not sure how long this deal will last, so if you want to take advantage of it, you might want to hurry. 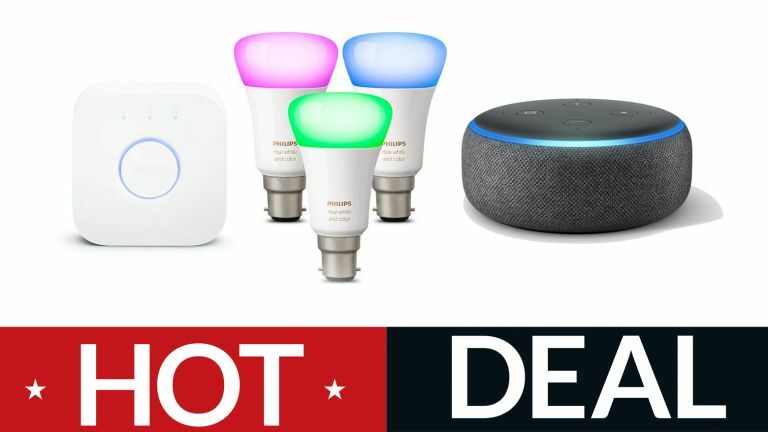 Three bayonet bulbs, a Hue Bridge and an Echo Dot is the perfect get-started selection but even if you only want the bulbs, this is a fantastic deal. You can also opt for the Dot in Charcoal fabric instead of Heather Grey if you prefer. Simply click through to Amazon to make your choice. For more Hue deals, including bulbs with different fittings, check out our extensive Philips Hue deals page.